Cozy knit sweaters are a winter must-have, and that’s just what we’re featuring as this week’s Fabulous Find. This tan-and-white striped sweater features a trendy hi-lo hem, but what we really love about this Charlotte Russe sweater is it’s versatility. The neutral color scheme means it can be paired with pretty much anything and the under $20 price tag makes this sweater quite the frugal find. Dress down this sweater for a day full of classes by wearing it with your favorite pair of bootcut jeans. Mint oxfords add a fun dose of color, while a brown satchel is an on-campus essential. 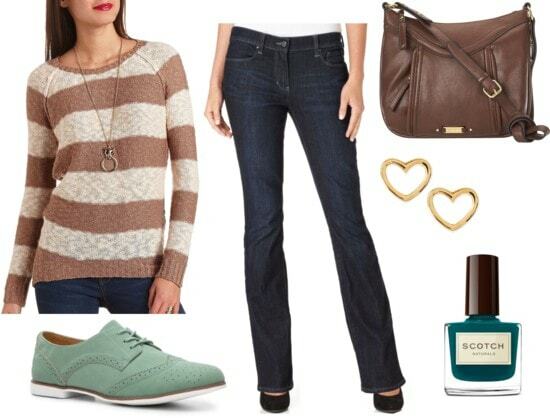 Accessorize with some cute heart-shaped earrings, then paint your nails a pretty teal shade to complete the ensemble. Pairing a knit sweater with a skater skirt always looks chic, and we especially love the combination of tan and oxblood seen here. Neutral tights streamline the look, while flat ankle boots keep things casual. Lastly, add some vintage-inspired flair by accessorizing with a cream-colored handbag and cameo necklace. This final outfit is a subtle yet stylish way to rock the mixed prints trend. Wear our Fab Find with a pair of muted floral print trousers, then add some color with a mustard yellow scarf. Fold-down combat boots and mixed metal rings continue the trendy vibe, while a bright lip color makes the entire ensemble pop. What do you think of this week’s Fabulous Find? Would you buy this Charlotte Russe sweater? Which look is your favorite? How would you wear a striped sweater? Remember to leave a comment below and tell us what you think!